Thank you for your interest in Veeam products! If it hasn't started, please click here. Your download will be sent to your email. Veeam® Explorer™ for Microsoft Exchange gives you instant visibility into your Exchange backups along with a number of other advanced features. 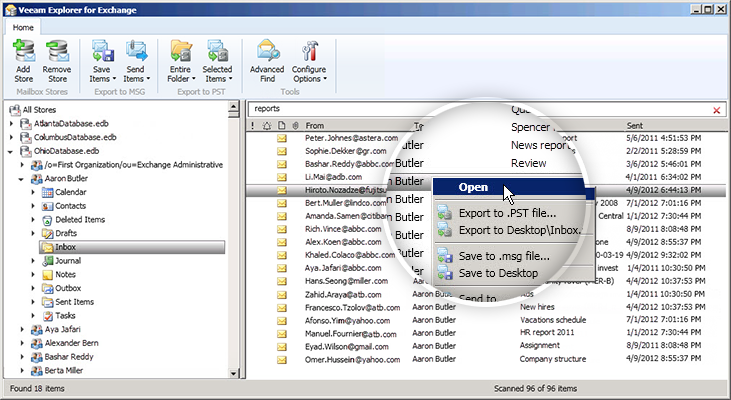 You can browse, search and selectively export items (emails, mailboxes, notes, contacts, etc.) directly from Veeam backups of your Exchange 2010 and 2013 virtual machines (VMs) – even compressed, deduplicated and incremental backups. With NEW Veeam Backup & Replication™ Community Edition, users can gain complete visibility into Exchange backups, perform advanced, granular searches and quickly recover individual Exchange items, online archives, permanently deleted items, and much more. There are no backup agents to license, deploy and manage. Veeam Explorer for Microsoft Exchange leverages agentless backup and recovery techniques to make Exchange restores fast, effortless and intuitive. 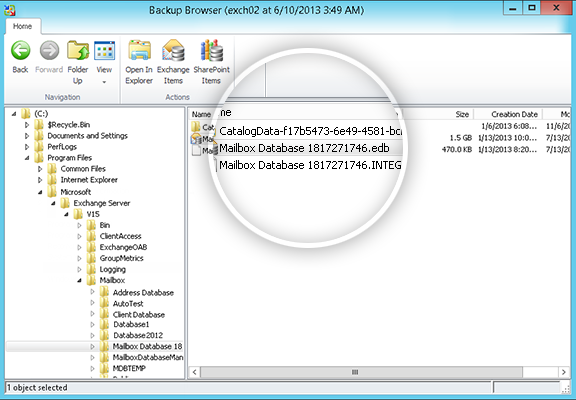 This functionality is included in the product without any additional license fees to pay, and it’s free of the hassles associated with running a separate backup solution specifically for Microsoft Exchange. 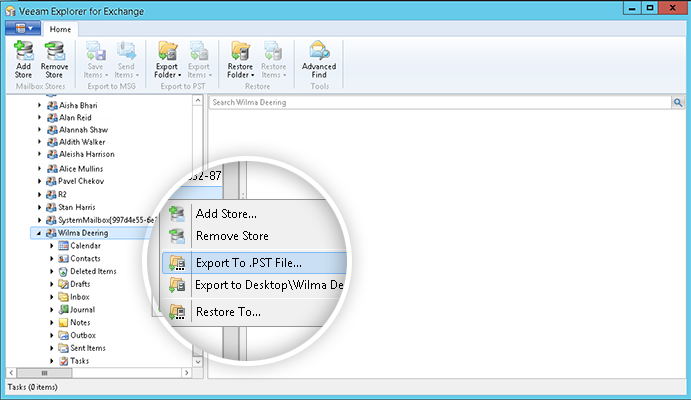 Use Veeam Explorer for Microsoft Exchange to browse, search and selectively export items. You no longer need to provision storage or restore entire mailbox stores; simply choose the Exchange Servers and restore points that you’re interested in. 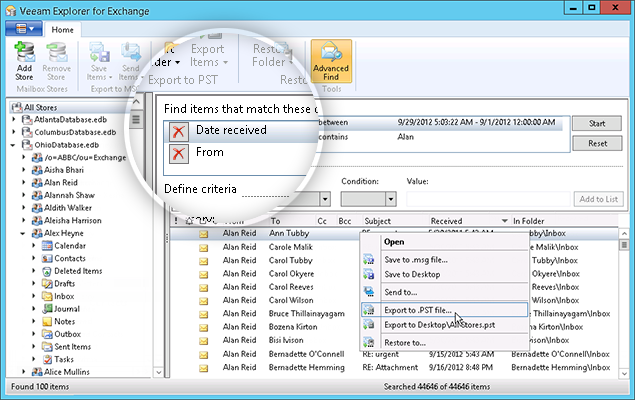 Find and restore Exchange items from EDB file – whether an email was accidentally deleted or a calendar item was corrupted by a script — and easily transfer these items back to the user. Archive an entire mailbox — from any point in time – to a PST file in order to ensure a smooth, complete handoff when employees leave or change jobs. Zero in on exactly the items you need for internal or external investigations – just apply parameter search for the required item (key words, dates, names and etc.). Veeam® Explorer™ for Microsoft Exchange is available in all editions of Veeam Availability Suite™, Veeam Backup & Replication and Veeam Backup Essentials™. It is also included in Veeam Backup & Replication Community Edition and can be used in conjunction with Veeam Agent for Microsoft Windows. For more information about supported features and editions, please refer to the edition comparison guide at the link below. Don’t pay for Microsoft Exchange recovery – try this FREE tool! Before we deployed Veeam, our IT infrastructure wasn’t agile enough to support rapid changes demanded by the business and ensure fast time to market. Veeam succeeded in making us agile. 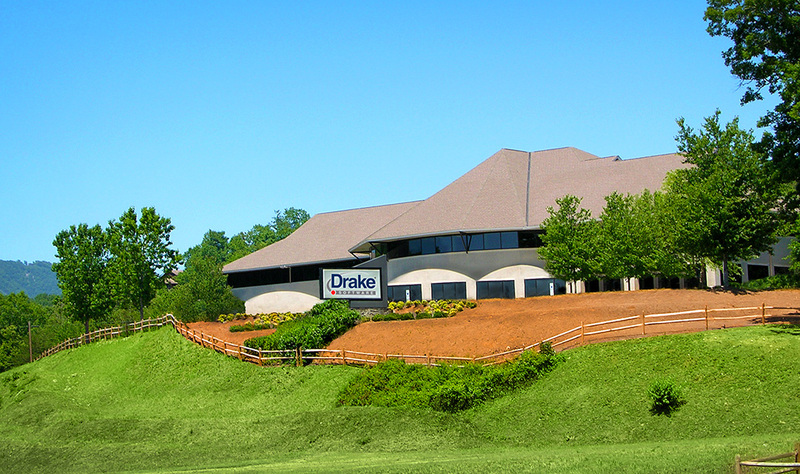 We secured 24x7 availability of critical IT assets and assured the business we can fully support their time-to-market requirements. Veeam is one of the pillars of virtualization, and it’s the reason we virtualized Exchange. With Veeam we can back up our Exchange VM once a day rather than once a week like before, and we can recover Exchange items in minutes. Prior to Veeam, recovering Exchange items was a full-day event. Veeam® is the global leader in Intelligent Data Management for the Hyper-Available Enterprise™. The Veeam Hyper-Availability Platform is the most complete solution to help customers on the journey to automating data management and ensuring the Hyper-Availability of data.